Between the 11th and 13th of August the Perseid meteor shower will take a shine to the sky. The meteor shower takes place annually and is one of the most looked forward to events in the astronomy calendar, requiring nothing more than to look up to see the spectacular show. What creates this spectacle is the Comet Swift-Tuttle. Although it takes 133 years for the Swift-Tuttle to orbit the Sun, it leaves behind a stream of dust and debris. Earth passes through this stream and the debris enters our atmosphere at approximately 30,000 mph. The meteors heat up to roughly 1,600 Celsius, vaporising through our atmosphere creating the classic shooting star and its long gas tail. 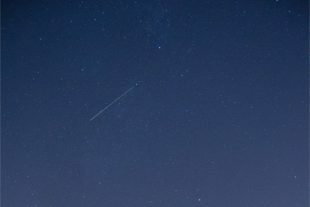 The Perseid meteor shower will be at its peak between the 11th and 13th of August in the early hours of each morning. To increase your chances of seeing up to 100 meteors an hour find yourself an area away from lights with an open horizon, to see as much of the night sky as possible and give your eyes some time to adjust to the darkness. After that sit back, relax and enjoy the cosmic show. Whilst relaxing and taking some inspiration from the stars and meteors why not have a think of a name for our Mars Rover competition. Enter here.